A great man, a great bond, great memories, a great day and a precious moment in time. Today I fulfilled a quiet goal of mine, all before the 1 year anniversary ticked over for the death of my Mum (on the 6th of July, which my family will be soon waking up to in Australia, but I won’t be living until the following day, due to currently being in Ireland). Today I shook the hand, talked, laughed drank coffee with, introduced to my Husband and Son, joked, compared stories, had photos taken and hugged a man who was very dear to my Mum. His name is Sean Whelan, and he lives in Killnaboy, county Clare, Ireland. 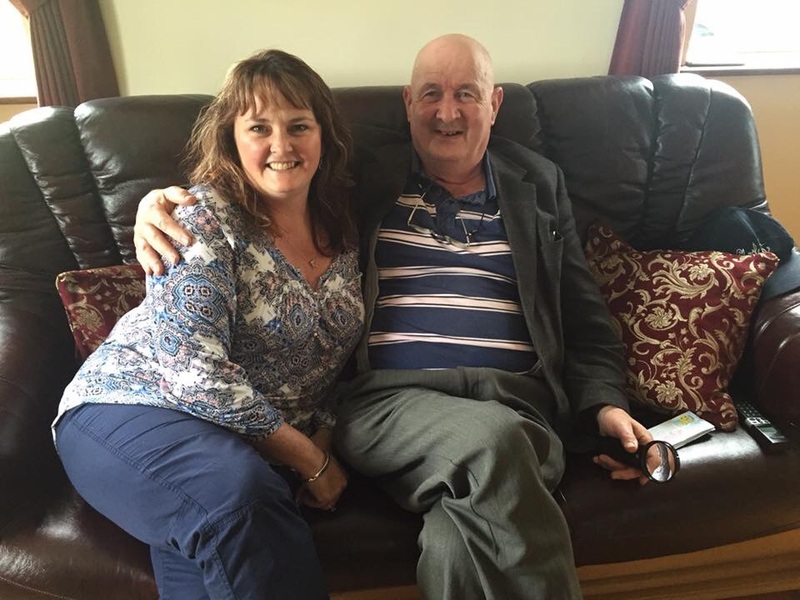 I first met him in 1994, 21 years ago when I visited Ireland for the first time with Mum. Right at the beginning of her quest to seek for Susan Kelleher, her Great, Great Grandmother who came from County Clare and emigrated on a Bride Ship to Port Adelaide in 1855, we came to Corofin to visit the Clare Heritage Centre. We were told by locals that we needed to meet Sean, as his mother was a Kelleher. We did and him and my Mum hit it off straight away. I remember him as being warm, welcoming, cheeky, laughed a lot, and smoked a pipe. 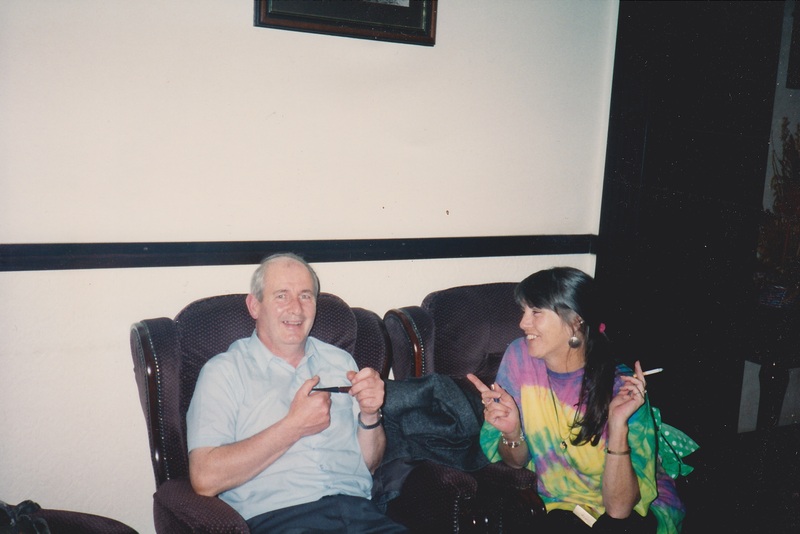 I remember the three of us went to a pub in Lehinch, a great little seaside town and I snapped a great photo of Sean and Mum sharing a cheeky joke. 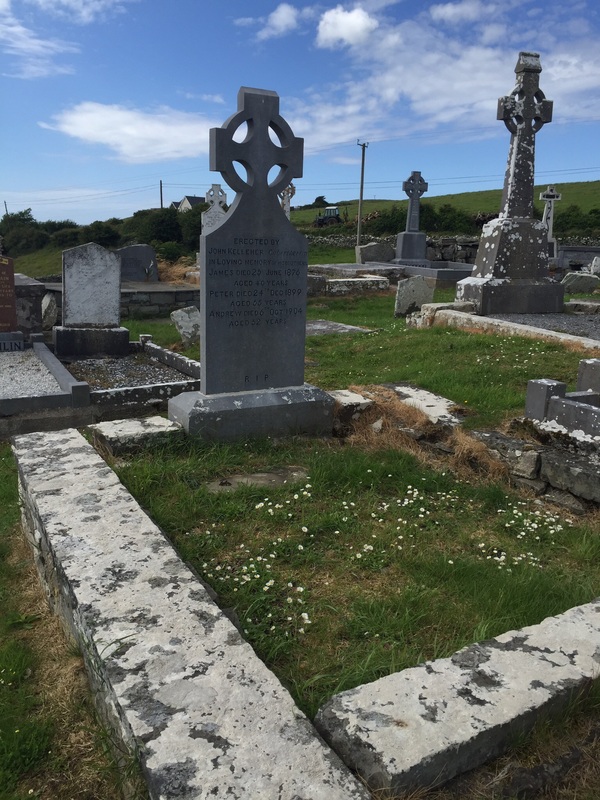 We visited a cemetary where some Kellehers were buried and tried in vain to find the headstone which was 90 years old and in bad shape, and being protected by a bull in the surrounding paddock. We didn’t succeed, but Mum and I often recalled that night in the cemetary and running from the bull. Mum went back to visit Ireland the following year, and met up with Sean again and they kept in contact over the years by writing letters, sending Christmas cards, and later, email. When Mum died, I found Sean’s email address on her computer and I emailed him. He was very glad that I contacted him, but very sad to hear the news. His words – “another bright star gone from our world” – were lovely. He asked me to send him some photos. It took me a while to follow up, but when I did, it was to tell him we were coming to Ireland and hoped to meet up with him. He said he was glad to hear I had “survived my great loss” and that he should be around when we were here, and looked forward to chatting. I hoped meeting up with him would all go well, but I really wasn’t sure. Without Mum there, who was the well read, enthusiastic learner that could share historical stories and anecdotes, what would we talk about? How would Jay and Bruce feel meeting him? Could I get them to understand how important this man was, even though I’d only met him once and we may not even be related? So many questions and I think it it was those questions that kept me from calling on our first day. Today was the day. I called after breakfast, got directions to his house which I had to write down in fear of forgetting them. It was important that I “not go past the tree mile mark out of Corofin”, I looked for the “wind charger on the hill”, looked for the “sooner bungalow painted morone” and We should find it. So much more complicated than an address out in to google maps. So we did and it was even better than I imagined. He was a gracious, welcoming host, was very kind to Jay, very happy to see us, and conversation flowed easily. He gave us detailed directions to the same graveyard and happily hugged me in a photo saying “maybe my cousin”. It was a fantastic day, and a very special moment in time. What a way for me to prepare for the upcoming 12 month anniversary of Mum’s death. 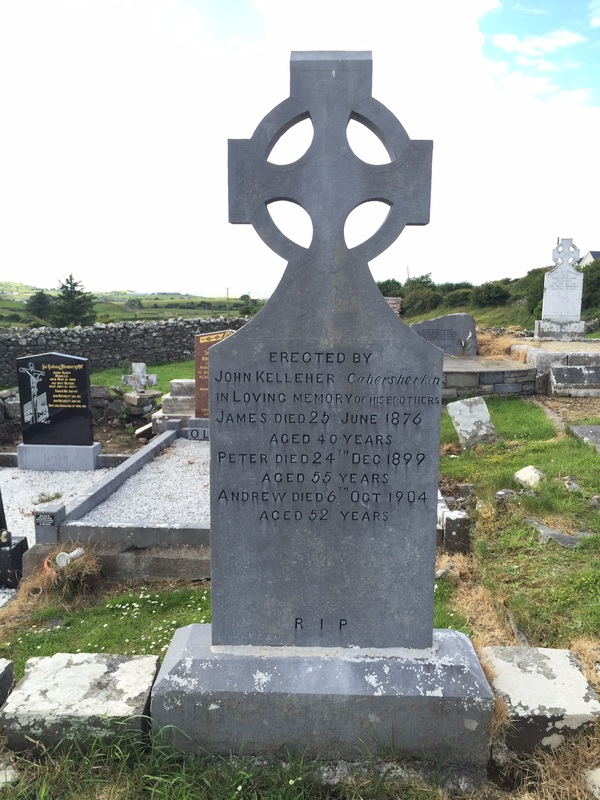 Then em to top it off, we managed to follow his directions and found the graveyard and the headstone of Sean’s Great Grandfather, Andrew Kelleher. The graveyard was much better maintained than 20 years ago, the headstone had been cleaned and so was easy to read and there was no bull. As my Brother recently said, our Mum is the gift that keeps on giving. Thanks Mum for introducing me to Sean all those years ago. Thanks for keeping and developing the bond and for giving me all the reasons in the world to be here on this amazing adventure and giving me the courage to contact him and arrange such a wonderful meeting. As my family awake in SA to the 12 month anniversary of that dreadful day when Mum was taken from us, they will see this post and know that Mum’s soul will be resting peacefully knowing that even without her being physically with us any more, that Sean Whekan is still connected to us. I love you Mum and I miss you more than words can say. Your Mum made a difference to so many people Kirra. You’re doing a great job of keeping her memory alive not just for your family but for all of us too and we’re grateful. One day I hope you complete your Mum’s dream of connecting all the dots and I know she’ll be at your side as you do. Thinking of you and your family now. Hope with each day you are feeling more at peace. Your journey is a wonderful tribute to your mum, who touched so many of us with her wit and wisdom and passion. She is sorely missed. Thank you Su, I’m really glad that’s how you feel. Thinking of you on your great journey and on the first anniversary of Catherine’s death. Thought about your Mum the other day with much love. Hope you are doing O.K. Love, Margaret Graney.